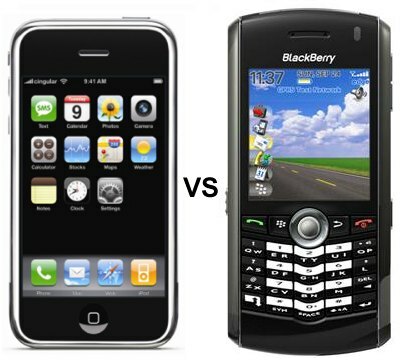 Blackberry Has Momentum to Handle iPhone Competition | BlackBerry Blast! RBC Capital Markets analyst Mike Abramsky believes that the RIM Blackberry has built enough momentum to hold its own against competition from the Apple iPhone. He believes it so much, he raised his rating from "sector perform" to "outperform" and sent the stock price running. According to Forbes Abramsky said, "While we continue to expect competitive launches, particularly Apple's iPhone, to pressure RIM's valuation, RIM's stronger than expected momentum may help mitigate this impact, reassuring investors its threat to RIM's consumer push may be less than feared." There was a lot of hype when Apple announced its iPhone offering. After all, it is a very slick looking device. As time has passed though, the people at RIM are seemingly more confident. In a recent interview with Laptop Magazine, co-CEO Mike Lazaridis said about upcoming iPhone, "...the touchscreen is not new. In fact, touchscreens didn't catch on the way people expected. People are very tactile. BlackBerrys are very tactile. We spent a lot of time on this keyboard because it's really hard to have both form and function excel at the same time. With the 8800, it's almost like a soft touch. It's easier to type on than any BlackBerry in the past." Can the Blackberry handle the competition posed by Apple's iPhone? Stay tuned.